"The Castle of Bolsover in Darbyshire, one of the Seats of the most Noble and Mighty Prince John Holles Duke of Newcastle, Marquis and Earle of Clare, Baron Haughton of Haughton, Lord Lieutenant of ye County of Nottingham and of ye Town and County of ye Town of Nottingham and Knight of ye Most Noble order of ye Garter." Very little is known of the original castle at Bolsover. It was raised by the Peveril family in the 12th century. A stone Keep was built c1173, surrounded by a curtain wall with an outer bailey, but the wall was breached in 1216 during the reign of King John. Surviving fragments of this curtain wall were later incorporated in a wall walk that can be seen in the castle garden. The castle became Crown property in 1155 when the third William Peveril fled into exile, but by 1400 it had lost its strategic importance. Years of occupation by tenants had left Bolsover Castle ruinous by the time it was purchased by Sir George Talbot in 1553. Talbot, later becoming the 6th Earl of Shrewsbury, is noted for two famous associations. Firstly, his marriage to 'Bess of Hardwick', probably the most astute business woman of the 16th century, who owned the vast Chatsworth estates; and then his lengthy term as keeper to the exiled Mary Queen of Scots, a 16 year duty that seriously drained the family's resources. To ease the financial burden, the castle was first leased to Sir Charles Cavendish in 1608, and five years later he became the owner. Employing Robert Smythson as his architect, Cavendish set about re-building the castle. The tower, known today as the little castle, was completed c 1621, and building work continued with their sons adding the terrace and riding school ranges. Used as extra accommodation, the Terrace Range originally consisted of apartments and kitchens, but with a Royal visit imminent this range was extended to include a long gallery and an external staircase. When Charles I and his Queen arrived in 1634, the Riding School Range was probably at foundation level. At completion, the school had every facility required, including a forge, a tack and harness room, a large arena, and an upper viewing gallery. One of the most notable features of the Riding School range is its magnificent timber roof. With the advent of the Civil War, Sir William Cavendish took command of the Royalist troops defeated at Marston Moor in 1644. Although he survived, he was forced to flee into exile and his castle was surrendered to Parliamentarian troops in August of the same year. After the reformation of the Monarchy in 1660, Sir William Cavendish was able to return to England and his now ruinous castle. Despite great financial problems, he added a new hall and staterooms to the Terrace Range and, by the time of his death in 1676, the castle had been restored to good order. His successors, however, chose to live at Welbeck Abbey and in 1752 they stripped the lead from the roof of the Terrace Range at Bolsover Castle to effect the necessary repairs to their preferred residence. 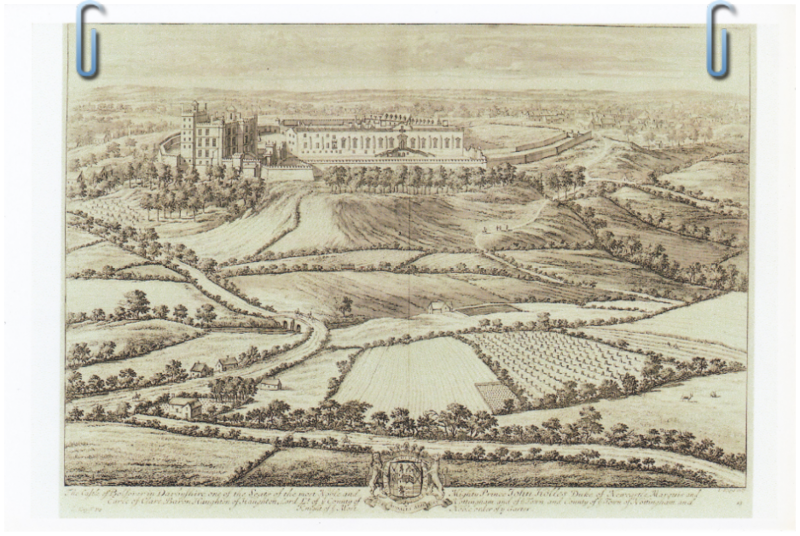 The Little Castle and the Riding School Range survived much better, and was let to the Curate of Bolsover in 1834. Following the death of his widow in 1883, the castle remained uninhabited and was eventually given to the nation by the 7th Duke of Portland in 1945. The castle is now in the care of English Heritage. This image is one of a collection by the famous local antiquarian, Thomas Bateman, of Middleton by Youlgreave. (1821-1861). Bateman organized his collection by inserting them into a 4 volume copy of Lysons Magna Britannia, Derbyshire, creating a fascinating and unique illustrated record of the county. The purchase of the collection for Derbyshire Libraries was made possible by the generous bequest of Miss Frances Webb of Whaley Bridge, well known local historian, who died in December 2006. Mr. Marshe’s lorry. 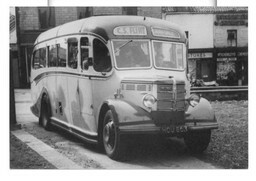 Used to transport items around the area and with seats a colliery ‘bus’ for Ramcroft. Notice the old Police Station at the top of the hill to The right. Circa 1900. The world awaits two World Wars. After two horrific World Wars. 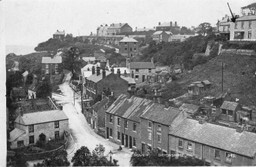 Hockley village and the castle. Primative Methodist Chapel. Across from the Angel public house. Marching past the Anchor Inn, presumably towards the Castle. C.S. Flint Carr Vale. ‘Flinty’s Flying Bedstead’. 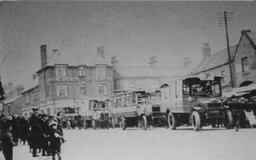 The War Memorial, Then left to right: Westminster Bank, Greenwood’s Chemist, Hollingworth’s Fish & Chips, Meadow Dairy. 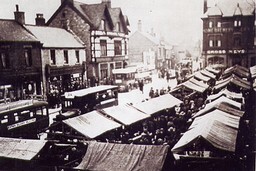 The Market Place at Carnival Time from the Cross Keys public house. Hockley and Hill Top. Circa 1900. The Castle with the keep under repair. 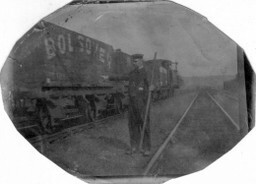 A shunter with a shunting pole at the side of a Bolsover Company wagon. 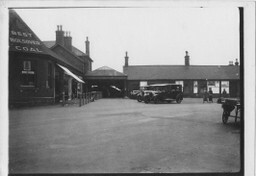 Skegness Station front. 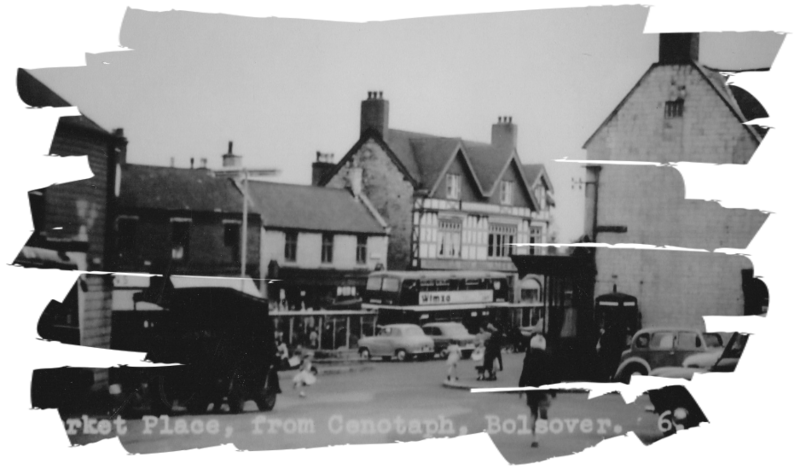 Building on the left advertising the sale of 'BEST BOLSOVER COAL'.